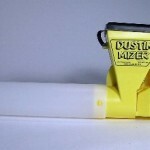 PRODUCT DESCRIPTION: The Dustin Mizer is a special applicator designed for applying dust. It will enable you to apply dust uniformly over garden plants and flower beds. It is lightweight, works by cranking and will propel a dust up to 25 feet. OPTIONS: This duster also has an optional "deflector" that's ideal for when you'd like the dust to project in a 45 degree angle instead of straight out. See the deflector on our DUSTIN MIZER w/DEFLECTOR page.